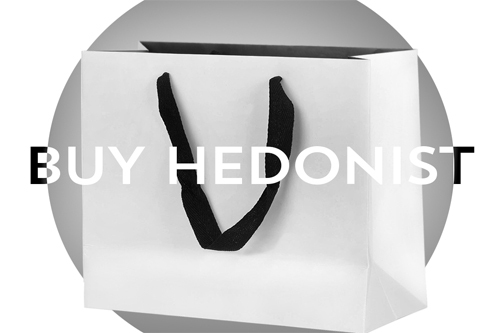 In this issue, Hedonist brings you the stories of true Londoners. Among them are Mobo Award winner Femi Fem, who has produced catwalk music for fashion designers such as Katherine Hamnett and Julien MacDonald. We also got a chance to catch up with Barrie Sharpe, the founder of the iconic fashion brand Duffer St George and one of the originators of music we have come to know as Rare Groove. Don't tell us you never tried Reggae Reggae Sauce! Because we also got the chance to talk to creator Levi Roots and find out the inspiring story behind his life, work and passions. This issue will also help you understand why generation yuppies are unhappy, why Krent Able is an upcoming comic genius, how a worldwide photographer Raphael Mazzucco became an artist, and much much more. This issue is dedicated to men. Just because it's their turn. This issue is a bridge between youth and maturity, a bridge between men of established classes and those who shop in the high street. A man must look as if he had bought his clothes with intelligence, put them on with care and then forgotten all about them. The Issue showcases the interview with Mark Powell, one of London's most iconic and influential bespoke tailors based in Soho; a real story of a bank fraud telling about the way the banking works, your online account and how your money can be stolen; conversation with John Mullan, international session stylist and founder of Stone Hair who worked with Lily Cole, VV Brown, Carmen Chaplin and many others; Miguel Dare, one of London's most energetic and fashionable DJs, gaining playing at the coolest East London hotspots. Plus: Angela Fraleigh, Martin Ron, The Valottes, tephen James and more. And as always, at Hedonist, we exploit the stories that matters to you providing London' s young talent in the world of fashion, music, art, photography and design with a platform of their work, getting them in front of the names that matter and championing the city's talent and keeping the eyes of the world focused on London. And one more thing. Always remember there are no old men, only the young and dead. We love a good story. Everyone does. Be it misery loves company syndrome, inspirational anecdotes, love stories (good and bad) or just some page turning drama – why? Because life is a story, therefore every life is a story waiting to be told. Plain and simple. It is with that sentiment that we created The Personal Issue. Because we want to hear the stories of the people we see everyday stamping the pavement with us. We want to see inside their homes; their artistic expressions, learn their love stories, and witness their failures and successes. Because it’s not buildings or landmarks that make up London, it’s people. The stories, experiences, talents, opportunities and failures is what makes this city tick, it’s what makes us tick and we hope it’s what make you tick. Inside the issue: Emmy J Mac, a soulful vocal singer, THE VOICE participant, an owner of the company which organises music events for young children and a series of children’s story books writer; Forgotten princess of R&B, Marusik Vladimir, a top party promoter, talks about one of the biggest parties in Europe; Prano Bailey-Bond, an inspiringly creative new music video director who has been described as “original, exciting and downright weird”; Sam Lambert and Shaka Maidoh, founders of ART COMES FIRST, bringing style and tailoring from yesteryear but with a decidedly current vibe. Plus: what is Typoglycemia, Mods Back in Town, Outstanding People and their Spaces, Caseable: Urban business success and more. The main subject of the second issue is devoted to people who, at first sight aren’t similar to the majority, with their pressing problems, misunderstandings and prejudices from passing by strangers. Their world seems unfamiliar and incomprehensible and consequently it’s frequently disapproved and condemned. The Hedonist magazine tries to penetrate into their problems and to tell everything straight from the source. We pried, asked inconvenient questions, and are presenting the material sincerely and honestly. Born in a wrong body: How Oman Abdullah became Amanda; Ronya Galka, a street photographer who is passionate about capturing transient and priceless moments, carries her photocamera continuously and whose pictures are used for the decoration for the New Castle Airport; interview with Thadboogie, a music man and a visionary who worked Kanye West, Mark Ronson, Baby J, Skinnyman, J Dilla, Cassius Henry, Wretch 32, T Love, Estelle; Maverick Sabre and many others; Ami Yamashiro, a Bricklane fashion designer from Japan; The Diary Of A Prostitute and more.